Did some progress in the code, for Single and Dual players. Borders, as usual, report current performance. Clown animation is implemented, but currently is too fast, since no pause is done yet for correct animation speed. User input, clown movement, pull and push balls, still to do. I guess the hardest part will be the physics and enable 2 players simultaneous play, right? There is no physics here, at least not in the real sense of the term. It's more like a state machine, in order to animate the travel of balls up and down (that didn't sound quite right, but anyway) . Still doing some artwork in parallel. Hmm, I see! I got confused with puzzle bobble for a moment, but you are totally right. Are you going to convert the music from the arcade to the Spectrum? 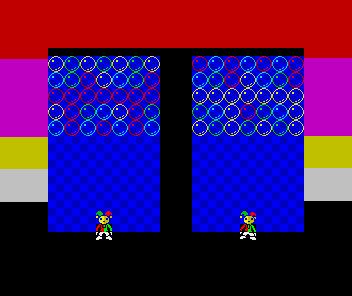 Actually, Bubble Bobble, does not use physics either, it just uses simple reflections on the walls (geometric calculations), and constant delta displacement for ball animations. To clarify, for me physics implies calculating position, based on velocity and acceleration, like I did for Steel Ball. In the extreme includes rigid body behaviour, like for example when a ball strikes another in a pool game, there is transfer of momentum (velocity*mass), and the amount of force that is applied depends on elastic coefficient. All theses are characteristics of rigid body physics simulation. Regarding music, Utz is busy. 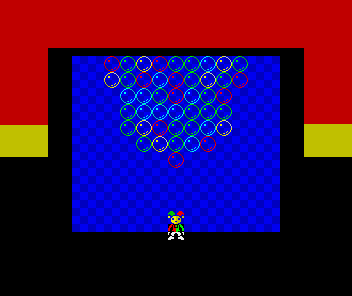 Currently I still have to find out the patterns of all players in the Arcade, while "injecting" combo output balls into the opponent. Each character has its own pattern, but it's hard to find out, even when playing against a non existing human, because there is drop of a new row of balls every 4 seconds or so. I probably have to save a video of me doing this, to find out, every pattern. Any one want to submit videos with this, to help out ? Looking very good! I guess I always loved to see how the arcade graphics looked in the Spectrum since back in the 80s! 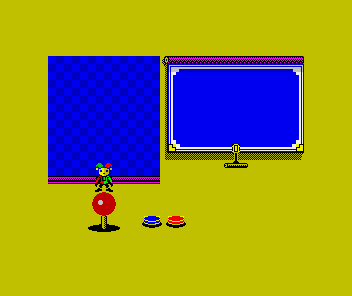 Since I'm planning to include some game play features from Magical Drop III, I'll include some of it's design too, as long as it fits well in current design. Once again, some size adaptation required, since arcade screen resolution is higher. This was probably the image that took more time to remake, since our eyes are very good at picking up anatomy errors. The fact that the original also has an arm that looks wrong/bent and a weird rist angle, did not help either. So to make her look good, a lot of work was required. Wish you all a Merry Christmas !!! NOTE: ZX joysticks do not have 2 distinct fire buttons (usually), but these can be any assigned keys, joystick or keyboard. Very nice graphics!! You are doing a great job. Happy Christmas for everyone in this forum! After a lot of reseach/reverse engineering of the Arcade game, i.e. looking at a lot of videos of on going gameplay, I was finally able to determine how the Overflow of balls happens from one player to the other, when doing combos. Basically, it all boils down to an Overflow Pattern that is distinct for each Character. Each Overflow Pattern is defined as a sequence of 8 full lines, that are applied in a loop sequence. Here are the Overflow Patterns I determined for each character. There are 3 AI extra characters (Devil, Strength and Empress) that I have almost entirely mapped, but I don't even know if I'll had them into the game yet. I'm also not counting ultra special character "Black Pierrot", that only appears if player as beaten all charracters, without loosing once. 1 - What is the character sequence, when playing against the computer (Versus mode), since it depends on player selected character. 2 - How the combo system calculates how much lines to overflow, since it doesn't seem to be linear. 3 - How character power (1 to 5 stars) actually affects gameplay. Any feedback on reversing engineering these 3 remaining items, is very welcome, since this is taking longer than expected. 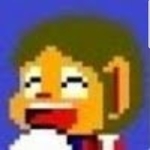 If someone would like to help, by playing the Arcade version using Mame, or by watching videos of it in youtube, that would be great. By the way, that care you are putting in the details, such as the graphics, make it look like an Ocean production! I like to remake an arcade game as faithful as possible. In this case, all these rules are very important, because they affect game play. In the end, I hope it feels the same as playing in the arcade, except graphics wise, which will be Spectrum "limited". But this game, was/is controversial and a real mess, since it was developed by a completely distinct company(developers) that bought DataEast rights to Magical Drop when they went bankrupt, hence the implementation is very different (3 versions after Magical Drop II) and messy (new rules and interpretations of the classic), and they kept changing it, after releasing the game on steam. 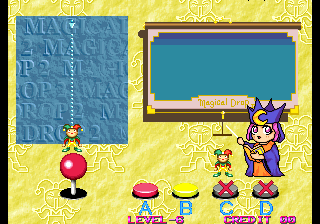 For example, I know for a fact, that in Magical Drop II (Neo-Geo Arcade version) I can make a "combo" that either sends 1 or 2 Attack lines, using the exact same number of balls (7), it depends on how the combo is made. However if we read the "Attack Chains/Lines per Class" in that last link, they never refer to something like this. They use fixed tables for each character. I'm either unable to reach such large combos consistently, or if I do, I beat the opponent very fast. Finaly, I can not assume that the Combo behaviour is the same for every character, because it most probably isn't. Reverse engineering, something like this proved harder than I expected, basically due to the complexity of the rules and patterns, and the fact that no real reference exists.